A growing number of people are concerned about their weight, as being overweight often leads to a lot of health problems. Gurin High Accuracy Digital Bathroom Scale with 4.3″ Display and Step-On Technology can enable you to monitor your weight so that you can take steps to lose it. 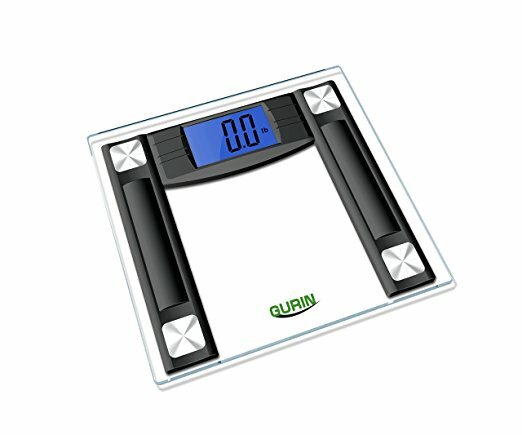 With a digital bathroom scale at home you don’t have to visit a clinic each time you want to check your weight. Smart Step on Technology – The innovative technology ensures that you don’t have to switch the scale on or tap on it to activate it to get your weight readings. All that you need to do is to step on the scale to get instant readings. Extra Large 4.3″ Display – The LCD display comes with a blue back light that makes it easier to read the weight readings in any light condition. The extra-large display makes it easy to read from any distance. High Precision Sensors – The machine is equipped with four high precision sensors. The innovative technology has been developed in Germany and enables you to get accurate and consistent measurements of up to 400lb. Auto-Calibrated – The auto calibration feature automatically turns off battery when not in use. This helps conserve the battery life. The device runs on 4 AAA batteries. Sturdy Tempered Glass Top – The glass top is extra thick and tempered and this guarantees safety. You don’t have to worry about the glass breaking when you step on it to check your weight. Non-Slip Feet – This feature ensures the floors are not scratched when you use the digital bathroom scale. The most important thing that you need to keep in mind when buying a digital bathroom scale is its accuracy and reliability in providing correct weight reading. You may be surprised to know that the monitoring features of some scales show differences in accuracy. If the readings are not accurate and reliable, you may not be able to come up with a good weight loss plan. Wrong readings can give you a false sense of weight loss. If you need to strain to read the numbers displayed on the scale, then it can be a frustrating experience. It is best to choose a scale that has excellent display features so that you can read the weight readings easily from a distance. A back lit display makes it easier to read. The digital bathroom scale should be easy to use. It should start displaying the readings the moment you step on it. Switching it on or tapping to activate the scale can be irritating. Ease of use is one of the important factors that you need to consider before buying. Ample Weight Capacity – The scale has a higher capacity of 400lb. This is an ideal capacity for home use. Different Mode Options – The scale offers weight measurements in both pounds and kilograms. Large Backlit Display – The large backlit display makes it easier to read in dim lighting. Individuals with normal eyesight may also be able to read from the large display without much effort. Small Measurement Increments – The small measurement increments on the scale offer accurate readings. The modern scales are designed in such a way that they are aesthetically appealing and can match the décor of the house. Before you buy a digital bathroom scale it is advisable to learn about the features, so that you can choose the best product as per your specific needs. For more information about Gurin High Accuracy Digital Bathroom Scale with 4.3″ Display and Step-On Technology you can contact Gurin Products at (888) 666-1557.